Set between the Governor's Mansion and the Pinnacle Condominiums, Governor's Beach is a popular beach for weddings, and it's use is free! This is spectacular for a sunset wedding, and during the week it is not crowded at all. I don't like to use it for Saturday and Sunday weddings because it gets crowded with families having picnics, umbrellas and such...but then, some people don't mind an audience. This beach has shade, from the casaurina and grape trees, making it a good choice for the summer months. The beach is very wide, and very clean and the location makes it an easy walk from many of the hotels and condos in the vicinity, so you can just walk down the beach to your wedding ceremony. A few weeks ago I did a Saturday wedding here for a large group, although most of my weddings here are for smaller groups. Because they were having chairs etc set up, when I got there I realised that the sun-bathers were taking up their positions to get a good view. A couple of them called out to me and said "Hey Joy, where's your hat?" That's because I usually wear one of my 40 hats when I'm on the beach, but that particular day I had been to the hairdresser for an up-do and I wasn't wearing a hat. I went over to them to say hi, and found out I had done their wedding last year over at Rum Point! 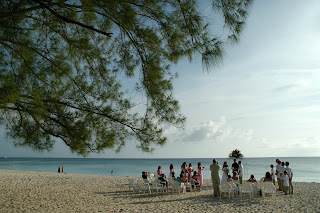 By law in Cayman your wedding can't be behind closed doors, which is no big thing since the vast percentage of weddings I do are at outdoor locations. Sometimes couples ask for a private beach, which can be problematic since all beaches in Cayman are public below the high water mark. My solution to this is to suggest a "quiet" beach which is usually away from the touristy bits of Seven Mile Beach, on the northern end.